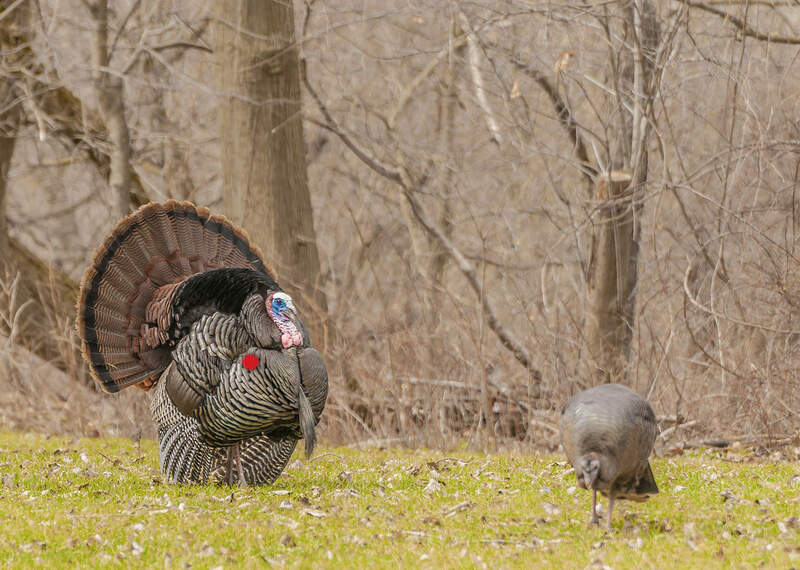 Spring turkey season is here. Study up on the guide to lethal arrow placements in a variety of shot scenarios. A Turkey’s VITALS ARE NO BIGGER THAN AN OVERSIZED SOFTBALL, SO SHOT PLACEMENT IS EVERYTHING. The photo above shows the approximate location of the heart and lungs on a non-strutting bird. This graphic gives you an idea on how the vitals and bone structure lay out. As you can see, the vitals on a turkey tend to be slightly higher than center of mass, so place your shots accordingly. Generally, the final wing joint will point to the heart. Use this as a reference point when placing your arrow. 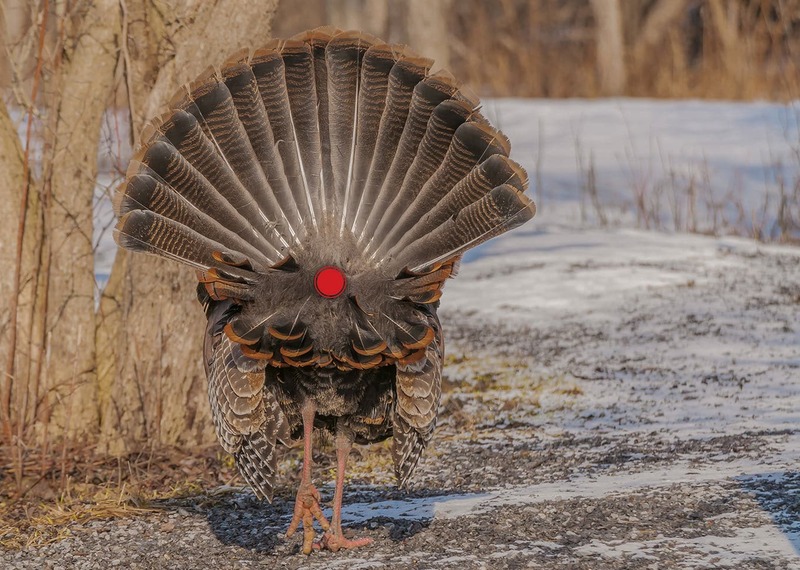 A turkey’s appearance changes significantly at full strut and can make pinpointing their vitals a challenge. A good general rule is to draw a vertical line just in front of the bird’s legs. From there, aim for the point where that line would intersect the crease in the wing as marked with a red dot in the graphic. A strutting bird facing directly away is one of the best shots to take. In this position, the spine is in a straight line and the base of the fan offers a perfect aiming point. An arrow placed near the “vent” will drive straight into the chest cavity and sometimes even sever the spine. Draw a horizontal line from the base of the bird’s beard. Then, draw a line straight up from the offside leg. An arrow placed at the intersection of these two lines should drive straight into the heart and lungs. If you hit high, you might impact the spine which is equally as effective, if not more. If the bird is in full strut at this angle, place your horizontal line approximately two inches below the base of the neck rather than the base of the beard. You also may need to move your vertical line a few inches forward from the offside leg. 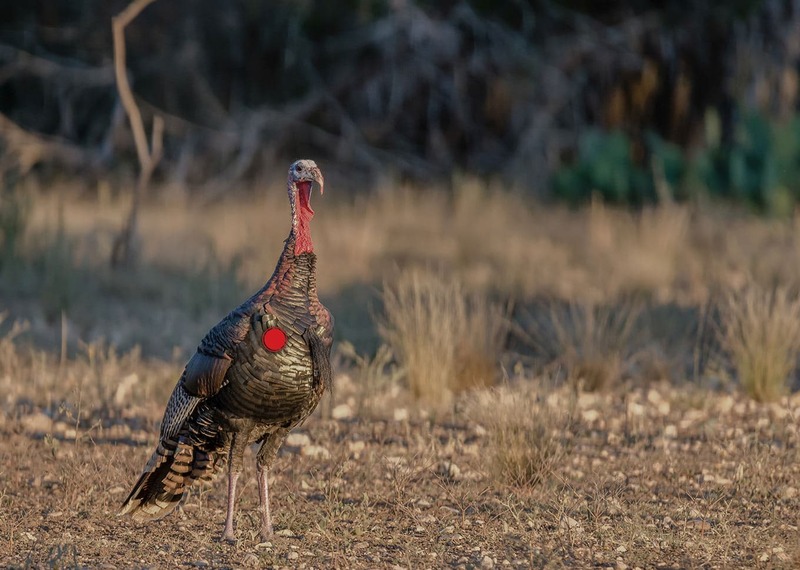 When a turkey is facing straight towards you, place your arrow between the base of the beard and the base of the neck. There is often a thin vertical line formed by the breast feathers that can act as an aiming point. A clean head/neck shot will produce devastating results. They key is to call the bird in close, and to release your arrow while he’s relatively stationary. A turkeys movements are often erratic though so be warned, this is a challenging shot.